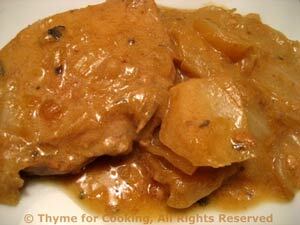 Braised Pork Chops with Creamy Cabbage, Thyme for Cooking easy main course. This is based on a recipe from the 'American Heritage' cook book I've for years. The cabbage has all the creamy goodness - without the cream. Use the apple juice if you have it - I buy the little 'juice boxes' for kids. Cut a slice off the cabbage, avoiding the core, and roughly chop enough for 2 cups. Heat oil in large nonstick skillet over medium-high heat. Add onion, paprika, and sauté briefly, 2 minutes. Move to the side and brown pork chops on both sides, 6 - 8 minutes. Add cabbage, apple juice or stock, sage, cover, reduce heat and simmer for 30 minutes, stirring and turning chops once. Remove chops and increase heat. Dissolve cornstarch in milk and add to skillet. Stir until thickened. Put cabbage on platter, top with chops and serve.